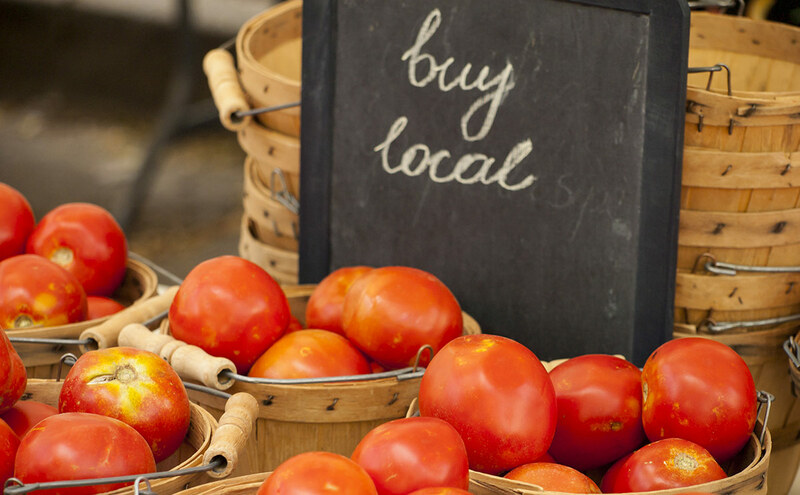 Think your farmers market produce is local? Think again. I became interested in sustainable agriculture in general in college, through my environmental studies, and learning about all of the problems with how our food system works: the fact that it’s not local, it’s energy intensive, it’s not good for the land that’s being farmed. So after college to get my foot in the door, I joined a workshare which meant that I did five hours of work a week for a share of vegetables. That was a great way to learn about sustainable agriculture and farming. I decided that I wanted to try farming full-time. The search to find a farm to work on full-time was pretty extensive, because there’s a lot out there in terms of farm apprenticeships. I narrowed my search quite a bit to be close to family, and I found what seemed to be a really great farm; they claimed to use all sustainable practices. They had a large CSA, which was really interesting because it meant that they were part of their local food movement — really important to me. I had a few conversations with the owner and his managers, and it seemed like a really great place. So I accepted the position, moved across the country, and began this farm apprenticeship – which was full-time work in exchange for room and board, as well as an education in farming. A woman approached me and asked me where we got kale from. And I responded how I had been trained to respond. The work itself was really great. I enjoy farm work: I enjoy working out in the greenhouse and out in the fields. So I really enjoyed the farming. We also got to do really fun things like going to markets and packaging CSA’s – which was really interesting again, being part of my local food system. That was really rewarding, and I enjoyed the work a lot. And then, after 4 weeks, something really strange happened. I was at market, and a woman approached me and asked me where we got kale from. And I responded how I had been trained to respond: that it was ours and that we grew it ourselves, which was, to me, a perfectly reasonable answer. It was a large farm: We have 15 greenhouses and 40 acres, it was perfectly reasonable to believe that we had grown this kale. Although I hadn’t seen it grown or harvested it myself, I had only been there for a few weeks, so I didn’t think anything of it. However the next night when I was taking out the recycling, and I saw the cardboard box that I had seen the kale in earlier that week, and I decided to take a peek at that box. That box had a sticker on it that said that the kale came from a large farm in Omega, Georgia. The farm I was working on at the time was nowhere near that area — I was up in New England. I was very shocked, and decided that I would speak to the owner first thing the next morning, which I did. I asked him where all of the products we were selling at the market were coming from, and he said that not all of it was coming from the farm, that some of it was coming from other farms, and I asked was it coming from local farms and he said some of it was not. He was honest with me — he said that they had to do it to stay competitive, and that other farms did it as well. So he told me that I should work for the day and think about it and talk with him again shortly about how I was feeling. Needless to say, I thought it was a bit strange that we were selling products at market that was coming from places as far away as Georgia. He asked me to re-package a crate of asparagus from Canada that were going to local markets and into our CSA shares. So the next morning I showed up to work, and my supervisor showed me to my duties for the morning. He asked me to re-package a bunch of salad greens that were from California into small plastic baggies with our farm’s label on it that were going to go to the market and be put in CSA boxes. He also asked me to re-package a crate of asparagus from Canada that were, again, going to local markets and into our CSA shares. So I was selling un-local food unknowingly. After I found out, I did not go to market. After packaging up this asparagus, I realized what was going on was completely wrong, and I found the owner and quit on the spot. I felt claiming to be a sustainable farm but shipping products in from all over the country was wrong. I also felt as though they were lying to their customers. I actually watched folks knowingly lie at markets. Other coworkers of mine told customers that the products they were buying were grown on our farm, when in fact they were not. And this all came as a realization to me very quickly, which was why I quit very quickly. I realized that when going to a local farmer’s market or investigating a local farmshare, you have to ask tough questions. Do you grow all of your products here on this farm? Do you ship other products onto your farm? If so where are those products coming from? Are those products grown using sustainable practices? I think the relationship between farmer and consumer is what regulates a local food system. I don’t want my experience to tarnish the local food movement. There are so many farmers out there working to bring great local food to market and to CSAs. I still believe in sustainable local food. I returned to the farm in Jackson Hole where I originally had a workshare on; I currently work there a couple of days a week, and I’m training to become one of the people that goes to market with them. I also work on the farm as part of the team that harvests the produce for the CSA and the farmer’s markets. It’s an incredibly rewarding job, and it reaffirms that there are those farms out there that are doing a really great job, and working hard to maintain the integrity of the local sustainable food movement. Thanks for that information, as a beginning farmer I would rather sell less and stay true to the local farm to community bond.